A little under over an hour ago, I had a near death experience that I felt compelled to write about. To a person who isn't aware of what I'm going through now or what I have been going through for many years, this might seem a bit hyperbolic. However, I suspect that when this whirlwind of injustice I'm going through is finished, that today's events will be even more symbolic for me. Lately, I've taken to bike riding every day near the Shaker parks where I am. I ride about 5 miles one day, 3 miles the next day, and so on. I'm 35, and getting to the point where my mind still thinks I'm as athletic as I used to be but my body is telling it otherwise. My professional life had become very sedentary and the essential hypertension diagnosis that is the downside of the genes I've been blessed with has made me very self-conscious of my health. Major changes in my life have given me the opportunity to rededicate myself to an active lifestyle. Yesterday, my 12-year son and mom were teasing me that 5 miles is not that much and hardly a reason to have sore muscles afterwards. So, I was swelling with alot of hubris as I was racing down the bike path that I take everyday, this afternoon. I normally continue on the bike path and backtrack, however, as a result of the hubris, I decided (in a split second decision) to bear a very sharp right off the path towards a train track crossing. My intention was to lengthen the path a bit and take a semi-off road path in the process. I had a helmet on and some open-finger gloves and was blasting Outkast's 'Elevators (Me and You)' in my ear, feeling emboldened from the adrenaline pumping through me as I was peddling as hard as I could. As I approached the train track crossing, I noticed there was a drop from the path to the wooden planks and I think - at the time - my intention was to hop down and back up. However, about 10 feet from the crossing, I realized - in absolute horror - that the drop was much more significant and there was no way I was going to make it at the speed I was going. I remember a shriek of horror escaping my lips - barely audible - and me panicking and pressing on the brakes. 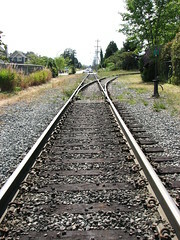 Either I pressed only the front brakes or the back breaks were not as strong as they should have been, but the nearly fatal result was that my bike began to capsize forward in slow motion as I was thrown off the bike towards the crossing comprised of wooden planks and solid-iron train tracks. I was flying towards the tracks at about 10 miles an hour and at an angle of about 45 degrees, head first. My instinct kicked in and I tucked into a tumble, taking a majority of the impact on my left shoulder, then my helmeted head, and eventually my right knee. I'm certain that were it not for the lucky angle in which I was thrown from the bike, my tuck, and the helmet which took a direct hit after my tumble, I would have been more seriously injured and probably would have been knocked unconscious. This would have had fatal consequences, as I'll explain later. Now, when I started to get up, lying sprawled in the middle of the train tracks under the rays of a sun overlooking an incredibly beautiful day, I took measure of my injuries and was stunned to find out that the most damage I had sustained was a series of surface wounds on my left knee. The back and left side of my head, which crashed into the floor of the train tracks, was not hurt in the way that would have led me to be concerned about a concussion. In a previous life (so to speak), I had my skull bashed in such a way that I needed several stitches on my skull and was therefore aware of the sensation of a serious head injury. However, the helmet did its job. I got up, and my immediate emotions were: shock at being able to walk off the tracks, sheer joy from being okay, and then eventual embarrassment. I looked around and saw there was no one in sight. I think no one witnessed this horrific bike accident. I walked off the tracks to my bike, which was also relatively unscathed, with the exception of the back wheel which was wobbling a bit. I gathered myself, pushed the bike to see if it was still functioning, and then froze in a chill as I heard the rush of a train ride through the spot where I was, no more than a minute or two after my incident. I'm certain, that if I had been knocked unconscious, with no one to witness what happened or warn the oncoming train, there would have been yet another horrible chapter added to my life, except it would have been the last one. I rode my bike gingerly to determine I hadn't broken anything, which is a good thing because I have no health insurance anymore. I turned back around, stopped, got off my bike, and immediately sat under a tree to meditate first and then contemplate my near death experience. In retrospect, my life didn't flash in front of my eyes in the moments I realized I was tumbling at full speed towards the depressed crossing. Rather, the only thought I had was: "I don't want to die, I have so much unfinished business!" It wasn't until I sat down under that tree that it all hit me and I realized how petty all the craziness I have been going through is in contrast to all that you stand to lose when you die. It was then that I realized also that the only other injury I had sustained was the shoulder that I tucked to break my fall and that took the initial impact. So, I got up, smiled from the knowledge that I escaped a horrible death, called my mother to let her know what happened and rode my injured bike and body home. The three lessons I take from this: 1) There is always a small victory in being able to walk away from a horrible situation 2) Bike helmets are life savers, for real 3) The fragility of life always has the power to wipe away hubris and almost any other such emotion in a split second.